How To Treat Upset Tummies and stop your child from throwing up. Nothing zaps you out of a deep slumber faster than a child leaning over you pronouncing the need to throw up. No one likes to throw up and no one likes to clean up throw up. When one of my children has an upset tummy, I waste no time getting that tummy feeling good again. I want the child feeling fine and I want the germs staying put and away from the other five people in our house. 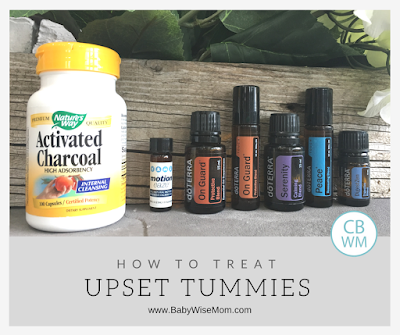 Here are my steps to treating upset tummies and preventing the spreading of germs. 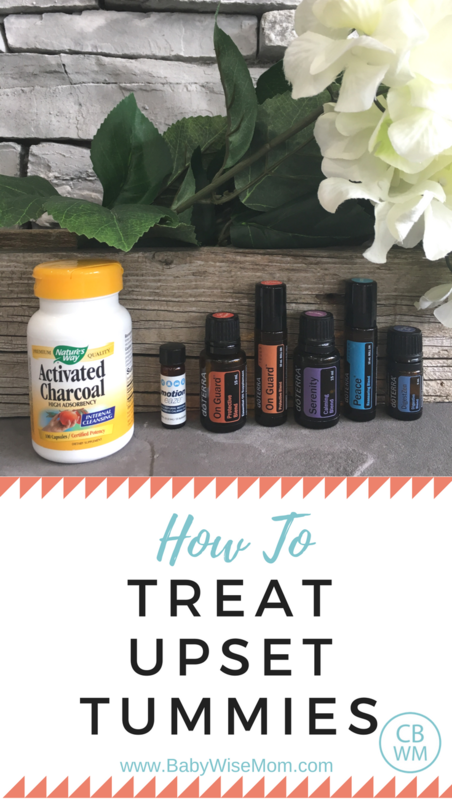 The first thing I reach for is activated charcoal (affiliate link). This is typically used for gas, but is very helpful when your stomach is upset. My kids who can swallow pills will just swallow two. For those who can’t, I empty 1-2 capsules into a small cup of water, stir it up, and have them drink it all. It is tasteless. I have heard (from Carrie over at Wiley Adventures) that having it in the cup of water might make it more effective faster than swallowing a capsule. Note: Do not take this if you are pregnant unless you talk to your OB first. Step two is not a remedy, but I get that kid a bucket or a bowl. If an incident is going to go down, I want the kid able to make it into a bowl and avoid the couch, bed, carpet…baically everything else. From a young age, we teach them to look down into the bowl. We save the 5 gallon ice cream buckets so we can use those for these fun moments. Then it is a “free” container you don’t feel bad about throwing away later. Motion Eaze drops are drops a friend told me about when I was pregnant with Brinley. It doesn’t take away the queasiness, but it helps take the edge off. Put these behind the ears and it helps you so you don’t feel so much like you need to throw up. Bonus on owning this, it is great for motion sickness. NOTE–I have linked to Amazon so you can see what I am talking about, but if you buy them, go to Walmart and get them for $5 instead of $20 (yikes). This is the oil blend from doTERRA that helps with digestive issues. Rub this around the belly button, smell it, and rub behind the ears. OnGuard is the oil blend from doTERRA that helps boost the immune system and fight off viruses. You can put drops on the feet, rub on the spine, and inhale. I always rub on the feet, spine, and have the child take a big sniff. Then I run it in every diffuser in the house in hopes of preventing things from spreading. I have this inexpensive diffuser from Radha Beauty (affiliate link) in every bedroom in my house. I have more expensive ones from doTERRA in the large rooms in my house. I encourage the sick child to sleep as much as possible. I find sleep a good way to slow the puking down, so it helps that way. Also, as Daniel Tiger teaches us, when you’re sick, rest is best. To help sleep come easier, I usually rub some Serenity or Peace essential oils on their feet and spines. I require the sick child to stay in bed until everyone has left for school. During the getting ready for school time, I encourage sleep as I just discussed. Once kids have gone to school. the sick one can move to the family room if he/she would like. We bring the sick child’s own blankets and pillow so the germs stay with the child. I spread a blanket out under the sick child so if any throw up makes it past the bowl, it hopefully lands on the blanket and not on the couch. Hand-washing is obvious. We all wash hands frequently. Once the sick child is better, I wash all of his/her blankets and pillows along with any others that may be carrying the germs. I wash anything I think needs to be sanitized, and I do it on the sanitize cycle. I will go around with some Lysol wipes (affiliate link) to clean up door knobs, remotes, and whatever else may need to be de-germified. I can’t always stop the spread of the germs; we are often contagious before we even know we are sick. But preventing even just one person from getting a stomach bug is WELL WORTH the effort I put in to trying to prevent it from spreading. Tips and Tricks: Got Gas?